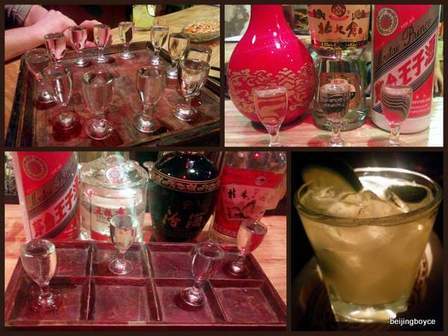 By Jim Boyce | Capital Spirits in Beijing plans to tease your brain then numb it as part of World Baijiu Day. For a solid week, customers at this baijiu bar can test their knowledge about China’s national spirit via quizzes and tastings to win prizes and, of course, fame. 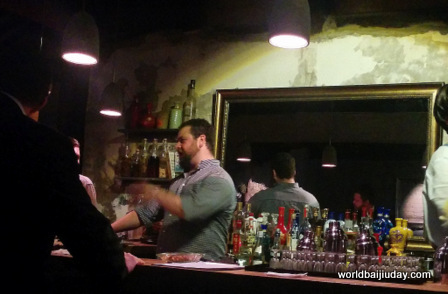 I talked to manager David Putney about this event and other baijiu issues. Let’s say you have to give a one-minute lowdown on baijiu to someone who knows nothing about this spirit. What three quick facts would you give them? Baijiu is the most popular spirit in the world. Baijiu is the only alcohol fermented in a solid state. Baijiu is actually an umbrella category for Chinese clear spirits: the difference in flavor between styles can be as great as the difference between Western spirits such as rum and gin. Baijiu flights are a key part of the Capital Spirits experience. Have you seen any general trends in terms of what baijiu styles people like? The biggest trend is about 85 percent of people change their opinion on baijiu after a flight. People who have sworn off baijiu have left our bar with a newfound appreciation for the spirit once they see that there are a plethora of styles with a variety of flavors. A trend we’ve noticed is that aged spirit drinkers—whiskey, brandy and rum fans—seem to like the stronger-flavored baijius, such as strong and sauce aromas. Vodka and gin fans oftentimes prefer lighter aromas like rice and light aroma baijius. You guys will be do a quiz for World Baijiu Day. Could you tell us a bit about it? We asked our dear friend Derek Sandhaus, author of “Baijiu: The Essential Guide to Chinese Spirits”, to write a short quiz on baijiu production and history for our World Baijiu Day event. He gave us 10 questions, divided into easy, medium and hard categories. Passing the easy section will earn you a free shot, passing the medium section will entitle you to a free beer, and conquering the hard section will bequeath upon the champion a flight or cocktail of their choice. If you want to see the actual quiz, you’ve got to stop by during our World Baijiu Day event. Finally, let’s say I’m heading overseas and want to take a couple of good but reasonably priced bottles of baijiu with me. What would you recommend? I’d say keep your bottle between the 元100 and 元250 price range. Anything less than 元100 will just be grain neutral spirits with flavorings added. Xing Hua Cun Fen Jiu, Luzhou Laojiao and Maotai Prince are all good choices there, and can be found in almost any baijiu shop. Note: Take the baijiu quiz at Capital Spirits from August 7 through August 14. Identify an intro flight of baijiu and win a beer or shot, depending on how well you do. Take the quiz written by Sandhaus and, depending on the difficulty level and your score, win a free shot, beer or flight / cocktail. More on Capital Spirits here.